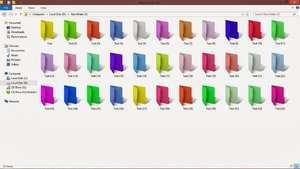 Folder Colorizer is a small Windows tweaking utility which adds some zang to your Windows installation by adding color to any folder/directory icons. The application comes with a list of eight different color settings but can be customized with a color wheel. Adding color to your folders is quite easy, as Folder Colorizer adds itself to system context menus; You can right click on the folders and use the "Colorize!" menu to add pre-defined or customized colors. Version 2.0.10 is a freeware program which does not have restrictions and it's free so it doesn't cost anything. For security reasons, you should also check out the Folder Colorizer download at LO4D.com which includes virus and malware tests. Additional screenshots of this application download may be available, too. Explorer addons generally add to or improve the functionality of your Windows OS. Free downloads are provided along with handy reviews. Check out some of the freeware downloads available in the explorer addon category. They contain no strings and are available at zero cost. Folder Colorizer has a presence on social networks.